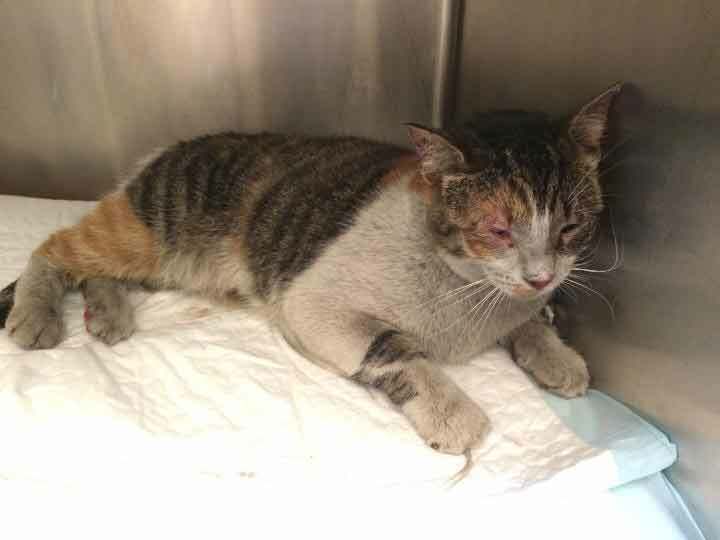 Harmony the cat died Friday morning after suffering smoke inhalation and burns to her face and paws, after a Delaware woman crashed into the Brandywine Valley SPCA facility in New Castle, Del. The woman and a number of cats in the shelter died in the incident. Updated, 7-14, 1125 a.m.: Harmony the cat died due to her injuries. WEST CHESTER – Four days after fire broke out at the Brandywine Valley SPCA (BVSPCA) New Castle Campus most of the fire victims have been placed up for adoption but the one cat who had remained hospitalized, died Friday morning. Nearly 100 animals were evacuated from the fire scene. At the time of the fire, Harmony was housed in the area behind the vehicle point of impact, the same location where three other cats lost their lives. “We are heartbroken beyond words,” BVSPCA spokesperson Linda Torelli said. Harmony suffered smoke inhalation and burns to her pads and face. She was immediately taken from the scene to a local veterinarian and is now in the care of a specialty veterinary hospital. She was initially on oxygen and IV fluids but has become strong enough to be taken off of oxygen. She continued not to have an appetite, so Wednesday the medical team fit her with a feeding tube to help her rebuild her strength, but her health turned for the worse Thursday. The other surviving animals cleared medical reviews with no significant issues. Following the fire, they were moved to temporary housing until space could be opened in the BVSPCA’s other facilities. “Thanks to an amazing response from the community and our friends in animal welfare to adopt or transfer animals that were in our other facilities at the time of the fire, we’ve been able to open space and move all of the adoption candidates from the fire into in our other campuses,” said Adam Lamb, BVSPCA CEO. Most are at the BVSPCA West Chester Campus. The BVSPCA New Castle facility continues to be closed. Work on rebuilding began on Sunday, the day of the fire. Power has been partially restored to the building, a remediation team began working on water and smoke damage on Sunday, and construction crews have begun work on the shelter side of the building. The veterinary clinic will be a longer-term rebuilding project. A timeline for partial re-opening has not yet been established based on the number of variables involved in rebuilding.